How to Fix UNMOUNTABLE_BOOT_VOLUME BSOD on Windows? Home »	Fix » How to Fix UNMOUNTABLE_BOOT_VOLUME BSOD on Windows? Issue: How to Fix UNMOUNTABLE_BOOT_VOLUME BSOD on Windows? Windows 10 returns a BSOD UNMOUNTABLE_BOOT_VOLUME during the boot phase. The system gets frozen and I cannot access my desktop. I cannot find relevant information about this bug, so I would highly appreciate your help! 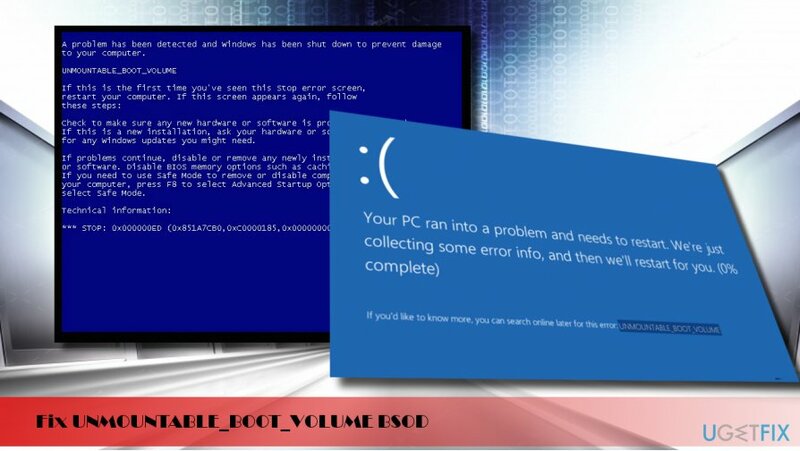 UNMOUNTABLE_BOOT_VOLUME is a Blue Screen of Death (BSOD) or Stop error, which may affect Windows 10, 8.1, and 8. It shows up on the Windows boot phase and prevents the system from booting successfully. The Unmountable_Boot_Volume error has a value 0x000000ED, so both the code and the technical name of the bug may be used interchangeably. Remove all external drives (CD, DVD USB) from your PC. Press Power button to reboot. During the Windows boot, press and hold F8 key. Using the arrow keys on your keyboard, navigate to the Repair your computer option and press Enter. Select keyboard layout and click Next. Select user name, type in the password, and press OK. When the System Recovery Option menu shows up, select Startup Repair. If necessary, reboot the system. Press any key to boot from the installation media. Select language, time, currency, and keyboard/input method and press Next. Click Repair your computer (NOT Install Windows) and select the type of OS you want to repair. Select Advanced and click Automatic Repair or Startup Repair. When the system detects the OS, select the one that is running on your PC. Finally, unplug the USB or remove DVD bootable media and try to boot your device. Click Power button and try to boot your PC. Press F8 key repeatedly at boot and select Repair your computer. Select Command Prompt and type the following commands. Press Enter after each one and DO NOT remove the space before / symbol.